A study in the June 2013 issue of "American Journal of Clinical Nutrition" found eating your daily five of fruits and veggies could lead to a longer life span. McDonald's smoothies contain fruit puree, fruit juice and low-fat yogurt, making them one option for getting some of your daily fruit servings. Depending on the size and flavor, the smoothies average between 220 and 340 calories. The mango pineapple smoothie comes in three sizes. The 12-ounce serving has 220 calories. 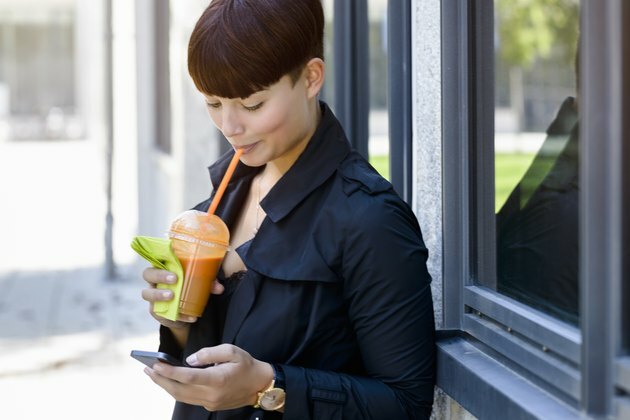 There are 270 calories in the 16-ounce size and 340 calories in the 22-ounce smoothie. McDonald's also offers small, medium or large sizes of the blueberry pomegranate smoothie. There are 220 calories in the 12-ounce, 260 calories in a 16-ounce and 340 calories in the 22-ounce large serving. The strawberry banana smoothie is also available in three different sizes. You'll consume 210 calories in 12 ounces, 250 calories in the 16-ounce size and 330 calories in the 22-ounce serving. You should examine the other nutritional facts of McDonald's smoothies before deciding if they are a worthy expenditure of your daily calories. Smoothies are low in sodium, but high in sugar. Depending on which size you choose, a McDonald's fruit smoothie has from 44 to 74 grams of sugar, which translates to 11 to 18 teaspoons. The American Heart Association recommends limiting sugar intake to 6 teaspoons daily for women or 9 daily for men.